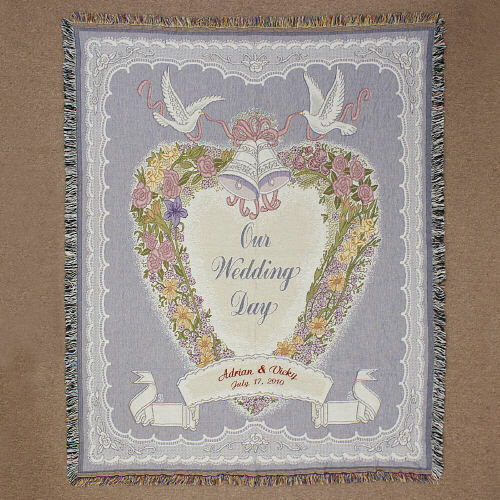 Cuddle up with the love of your life with our Embroidered Wedding Day Blanket. Personalize this blanket with your choice of any couples names and date. 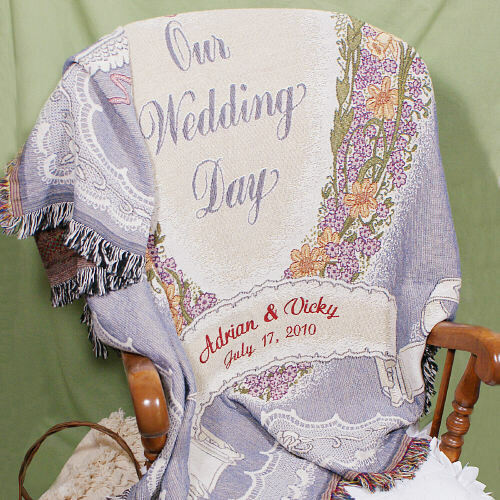 This beautiful wedding way tapestry throw is a thoughtful gift that can been given to the newlyweds! Wedding Tapestry measures 50" x 70"
Nice quality and personalization was excellent! Happy repeat customer! Would definitely reorder. Beautiful throw blanket, great quality, the names look great... All around great experience. Very happy with my purchase. It's gonna be a gift, can't wait for them to see it. Purchased several for family members. All very happy with them. Additional Details Find great personalized wedding gifts for the couple, the wedding party, and even the newlyweds' parents at GiftsForYouNow!